…… a rather blustery day. Fortunately, Pooh's thoughtful spot was in a sheltered place. He sat down and tried hard to think of something. 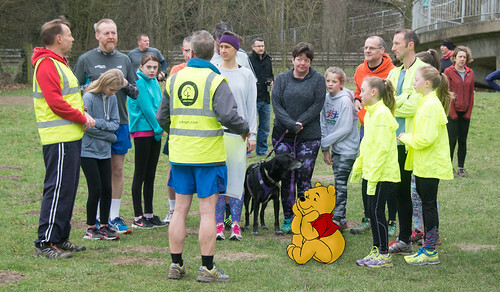 Winnie the Pooh is a very keen parkrunner and, as everyone can see, he’s long since earned his bright red 50th parkrun T-shirt. Wearing it makes him a very happy bear. But Doris had given the Hundred Acre Wood a good ol’ blustering and so his local parkrun there was cancelled. What to do? What to do??? The answer was pretty obvious really! And so along with 178 other lovely parkrunners he made his way to Tring Park. It was a record turnout morning. Never ever had there been more runners at a Tring parkrun in February. Pooh was mesmerised - "Tring Park is even better than the Hundred Acre Wood" he thought to himself! Along with 9 very welcome first time parkrunners (Philip, Jacob, Daisy, Robert, Sophie, Kelly, Tom, Kurt and Craig) he joined 12 others (Lesley, Liam, Emily, Lauren, Richard, David, Gareth, Katie, Ian, Laura, Jean and Tony) who were visiting the enchanted lands of Tring Park for the first time. He sat and listened, transfixed, to Andy and Chris as they earnestly delivered the New Runners Briefing. 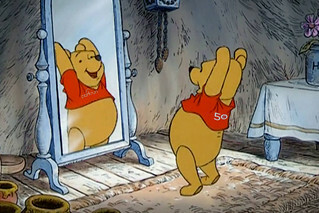 They’re even wiser than Owl thought Pooh! And Andy is just the same size and shape as me too! Pooh liked Andy and Chris. Pooh liked all of the other volunteers too. He thought Matt, Kevin, Kirsty, Moira, Ken, Sam, James, Jim, Clare, Richard, Dennis, Hamish Kaja and Blazej were all brilliant. Jim and Ken reminded him a bit of Tigger though! Before you could say rumbly tumbly - they were off. 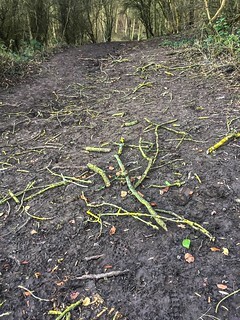 Many of Tring's paths were carpeted with Doris' handiwork. Pooh took care not to slip, just like the very nice RD said. Pooh is normally a sub 22 minute parkrunner - because running away from bees is better training than hill-intervals or fartlek!! But the Hundred Acre Wood only had mole hills and not these huge things that soared up towards little black rain clouds! "This is not stuff and not fluff!" he thought to himself. And he gave up trying to keep pace with Ben and Claire! "Once in while something amazing comes along..."
Up front Ben Lindars was the first finisher, as he has been for 3 runs in a row. Bouncy! Next Claire Hallissey was first female finisher for the 30th time!! Boingy! Cliff Morgan, Darren Herbert and Gareth Tucker all ran their 2nd PB in a row. Splend-eriferous! Of those who’ve run 5+ times at Tring, 4 recorded PB improvements of over a minute including Caroline Neill (3:58), Woody Day (1:44), Marcus Birch (1:22) and Rachel Wray (1:16). Flouncy and pouncy!! Two juniors (Marcus Birch and Edward Scott) reached their 10-Club milestones and earn a free, white Tribesports T-shirt. That's amazing! 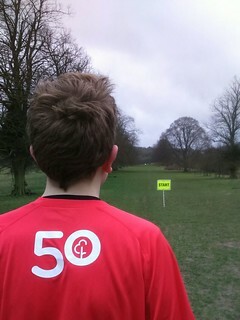 Anna Last, Ross Lambert, Kirsty Newman all completed their 50th parkruns and earned a coveted red T-shirt. That's tigger-ific! 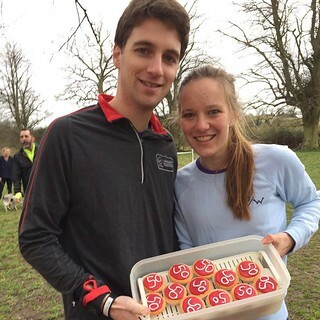 Ross and Anna with just some of their celebratory 50th parkrun cakes. 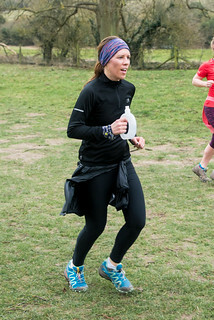 Kirstie Newman also reached her 50 parkrun milestone. "As the most informed creature in the Wood...."
Gus was the 48th person to run 48 times at Tring parkrun - and got a PB too! So great fun was had by all at another excellent Tring parkrun. Being of very little brain Pooh forgot his barcode. No barcode - no time - no exceptions! He really is a silly bear after all. See you all bouncy and bright next week.